On the way to your family’s house for Thanksgiving dinner with the extended clan? 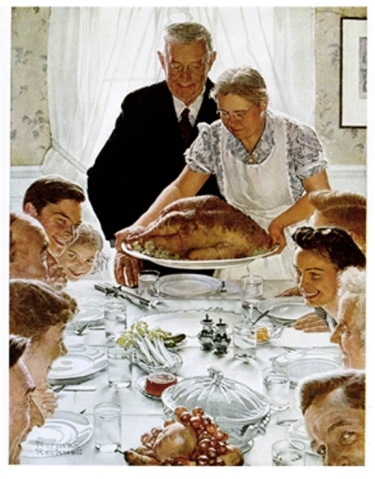 I’m going to guess that your dinner table companions do not resemble the ones in this famous Norman Rockwell painting, except maybe the guy in the bottom right hand corner. He looks a little creepy…. Which it is why it is very important to get to the dining room table first so that you can stake out the best seat, far away from your repellative (our term for ridiculously crazy relatives), and close to the exit. Hopefully, you have done some deep breathing exercises in the car on the way, and have packed a little flask of holiday spirits. Wishing you a thankful day. This entry was posted in Uncategorized and tagged #crazy, #creepy, #dinner, #dysfunctional, #family, #holidays, #relatives, #repellative, #turkeys, #wine, #writing, Thanksgiving by thebufferzoneday. Bookmark the permalink. This year, it is family’s crazy friends that are the ones to be concerned about. Just when I thought my family was sane, they go and invite company. While that is worrisome, you can comfort yourself with the fact that you don’t share their DNA. I think the seat I got was the cantankerous one – anyway, I was not on my best behavior. Always Christmas to make up for it :-).